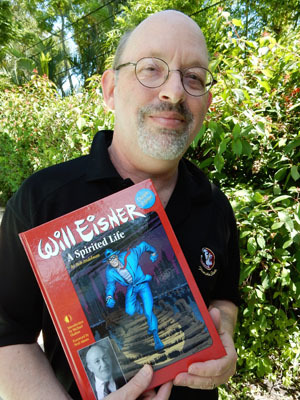 Our Deluxe Edition of Bob Andelman’s book Will Eisner: A Spirited Life ships today, and what a proud papa Bob is! This full-color hardcover is what he always envisioned the book to be, with expanded text, gobs of luscious Eisner art, and a beautiful presentation that makes it a totally different book than its original, out-of-print incarnation of more than a decade ago. I’ve waited years to publish an amazing book on Will, who’s my second favorite comics artist (after Jack Kirby, of course), and this is finally it. Check out the preview HERE; I think you’ll be impressed! To promote the book, Bob’s already embarking on a book-signing tour, and below are the confirmed dates where he’ll be signing, and putting on his talk/video presentation on Will’s life and career (not to be missed!). So be sure to stop by and chat with Bob when he’s at an appearance near you. Saturday, May 16, 12-3 p.m. This entry was posted in TNT on 29 April 2015 by Mr. Morrow.